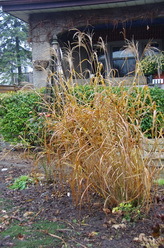 Dallying In The Dirt, Issue #120 --- We leave some winter grasses when doing the fall cleanup. You didn’t get any pictures with the last issue of Dallying In The Dirt because I was rushing to catch a plane. Had a wonderful time playing with two granddaughters in the North of England. It was sunny and bright most of the time but rather frosty in the mornings. Gardening is so much more intense over there and they utilize every possible space to grow things that I cannot. Not that I’m envious. 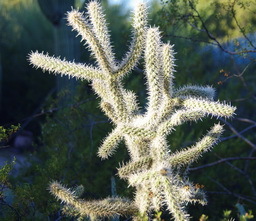 The lack of pictures means you didn’t get to appreciate the desert flora from my visit to Tucson. I now have a whole page about the Tucson Botanical garden where you can go and get a sense of the diversity of succulents that thrive there. 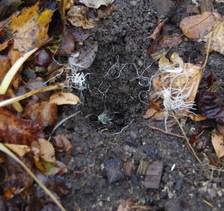 Meanwhile back at home, there are a myriad of undone tasks to get the garden ready for winter. I’m cutting off all the spent foliage from most of the perennials. I’m particularly fastidious about the Iris because the infamous Iris Borer spends the winter as eggs on the old foliage. Any other foliage that is soft is added to the compost. A few of the grasses that have stiff stalks and attractive seed heads are left to poke through the snow to add some interest to the winter garden. What leaves I have are raked and mulched and then added to the tops of the perennial beds. The water barrels are emptied and used to soak the evergreens and new bulbs so that they can survive the winter. Evergreens will suffer in the sunny days of next spring as they respond to the sun and warmth and start to give off water through transpiration and then cannot replace it with any moisture in the soil. The vast army of bushy tailed tree rats, (AKA squirrels,) that inhabit the garden are making themselves even more unwelcome this fall. They did help out by eating most of the walnuts and thereby saving me the effort of picking them up. With the walnuts all gone they seem to focussing on the 650+ tulips that I spent days planting. At first I thought they were just getting the more shallowly planted Crocus but it now appears that they are digging deeper. The layer of Acti-Sol, a chicken manure based fertilizer that usually repels squirrels, does not seem to have been as effective this year and I have just added a new layer of it. I’m worried that all of my planting efforts will not yield the desired blast of spring colour. I’m also worried that the ravenous appetite of this year’s squirrels is an indicator of how severe the winter might be. When it’s too nasty to venture outside, I descend to the basement and continue potting up the dwarf Narcissus that I will be forcing into bloom by late February. The need about 8 weeks in the cold room to overcome their dormancy. This year I also have a box of Paperwhites that will bloom in a couple of weeks after planting and do not require a cold period. Should have them in bloom well before Christmas. Of course there are the usual Amaryllis to be potted up or wrapped up as Christmas presents. The annual planting of those bulbs with the grandchildren is an event we all look forward to. We are still eating from the vegetable garden. A few things such as Leeks and Brussel’s Sprouts actually improve in taste with a few light frosts. Other things such as Broccoli, Swiss Chard and Celery just keep on growing until a severe freeze knocks them down. I also have a few Pak Choi that I planted in late August, now yielding their lovely white crunchy stalks. The area that I worked so diligently digging out all of the random Garlic now looks like an fresh green lawn. 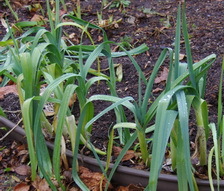 Apparently I missed a lot of small garlic cloves that are now happily colonizing that bed once again. I have an abundance of Leeks still in the garden so it is time for one of my favourite ways of storing vegetables for the winter. A large pot of Leek soup will be on the stove early next week. It’s easy to make and can have a dozen variations depending on just what herbs or vegetables are available to go into the pot. Soup for lunch on a cold winter’s day is warming and nutritious and a great way to remember all of those wonderful summer days in the garden. Pea soup, squash soup, Red Pepper soup and many others can be made with the surplus produce from even the tiniest garden. Let’s not forget the baked beans made with all of the dried beans that we didn’t get time to pick when they were fresh green beans. I just collected some of them this week when I was taking down the trellis that supports the Pole Beans and Morning Glories. There are so many aspects to the gardening life that delight us in every season. Time to answer a few questions. If you have a gardening question just ‘reply’ to this newsletter and send me your query. I try to answer most of the questions and the ones that I answer here are those that I think will have the widest interest. 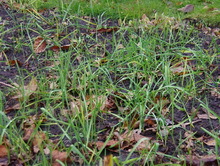 You can also find the latest garden updates on the front page of gardening-enjoyed.com. Pauline Asks? I have been trying to compost and have not seen a finished product in years! Should you keep adding to the pile with vegetable scraps and leaves, or do you get to a point where you leave it alone and let it work? I have done the layering, added water, and turned it 2X a week. Ken Answers! I think you are trying too hard. Fill up the compost bin, paying some attention to the various layers, make sure it has some water and then go away and let it compost. I’d be exhausted turning my compost more then once a year. I keep a black plastic lid on mine to help raise the temperature. Barb Asks? In your talk on impatients I’ve been hearing about a soil fungus and you should wait 2 yrs. before planting again. My neighbours were beautiful then they just died off, so did mine. My other neighbour hers were great all summer. So I don't know if it's just those flowers only or not to plant anything? Ken Answers! The downy mildew that is now attacking our Impatiens, produces two kinds of spores. One is wind borne and spreads the disease during the growing season and the other is soil borne and will persist in the soil for two years, infecting the next year’s plants. Impatiens growing in warm sunny areas seem to be less bothered by this mildew than plants in the shade. Vivian Asks? I have a pink pineapple lily plant that I planted in a pot very late this year.....probably early August. It took a while to sprout up and did not come to full maturity ( no flower ) before the weather turned cold and I had to bring the container in. I am wondering if I should let it grow in the pot or would it be okay if I stored it again as a bulb, cutting off the existing leaves. In other words is it okay for a bulb not to go through it's full cycle. I am hoping it will be okay for next spring. Ken Answers! Pineapple Lily, Eucomis spp. are summer flowering bulbs that are usually grown in pots because they are not reliably hardy outside of USDA Zone 7. 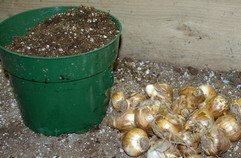 It’s unlikely that your bulb grew long enough to regenerate itself, so the best bet may be to try and keep it growing in its container all winter and take it outside again next summer. Dale Asks? I have a few potted strawberry plants and I am unsure how to store them in the winter. I have taken them into my garage already but should I cut them back or just leave them as they are and keep the soil moist over the winter? I am more concerned about the miniature Allstar Strawberry plants. Ken Answers! Strawberries in a pot should survive the winter if they don’t get frozen solid. Your garage should help with that. I would cut them back as they are not going to get any light and make sure that the soil does not get too dry over the winter, that will depend on the temperature in the garage. It should work out well. Rose Asks? I have brought in a calla Lily, a mandivila vine, & elephant ears, Can I put any of these to sleep for the winter? I don’t have a cold basement, just regular home temperature. My garage will freeze when it gets really cold. Ken Answers! The Mandevilla needs to be cut back and then kept in a sunny spot to keep growing. Watch out for an attack of Spider mites. The Calla and Elephant Ears, (Colocasia spp,) can be lifted from the soil and dried out. Put them in the coolest dark spot in your house and start them up again about March to get ready to go out next summer.